A Lot Of Pokemon Games Available In Google Play Store Already Like Pokemon(AR Mode), Pokemon Duel, The Magikarp Jump And More. 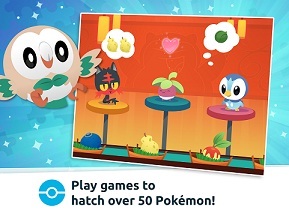 Pokemon Playhouse Is The New Game In This List. Like Other Pokemon Games, This Game Also Brings A Lot Of Fun. Best Suitable For Younger Pokemon Fans. 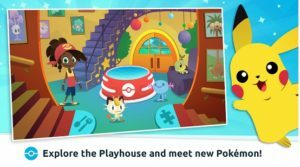 In Pokemon Playhouse, Explore Various Areas(The Tower, The Louge, And Playground), New Pokemon, Hatch Eggs, And Complete Activities. Within Pokemon Playhouse, Every Location Features Activities For Pokemon Younger Fans Like- In Search The Star Activity, You Have To Identify Pokemon In The Night Sky. In Pokemon Grooming Activity, Taking Care Of Your Pokemon. At The Beginning Of Pokemon Playhouse, You Will Be Given A Pokemon Egg To Keep Track Of. Completing Of Activities Will Hatch The Pokemon Egg And Revel A New Pokemon. The Game Is Designed For Children Ages 3-5 Years. There Is No Need Of Knowledge Required To Play This Game i.e. No Reading Skills, No Math Skills. A Friendly Human Character WIll Host And Narrate Every Aspect Of Pokemon Playhouse. This Probably The Best Pokemon Game For Kids. Game Does Not Collect Any Kind Of Personal Data. To Listen To A Story, Head To Playroom And See Pokemon Go On Exciting Adventures. You Can Download Or Install This Game From Google Play Store. Game Requires Android Version 3.0 Or Above.